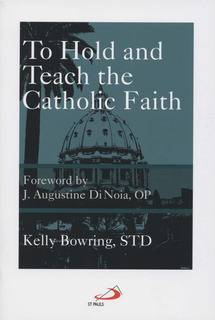 Dr. Kelly Bowring is a Catholic theologian and popular speaker. He received his pontifical doctorate from the University of St. Thomas Aquinas (Rome), his licentiate from Dominican House and the John Paul II Institute (Washington DC), and his masters from Franciscan University of Steubenville (Ohio), and has the Church's mandatum to teach theology. Dr. Bowring has been Dean of the Graduate School of Theology & Program of Catholic Studies (GST) at St. Charles Borromeo Seminary; has been Dean of Spiritual Mission and a professor of sacred theology at Southern Catholic College; and an institute director and theologian at St. Mary's College of Ave Maria University. He has been featured as a Who's Who among America's teachers. Known for his dynamic yet understandable teaching style, his books are sure to please any reading audience. Dr. Bowring and his wife, Diana, have eight children and live outside Atlanta.